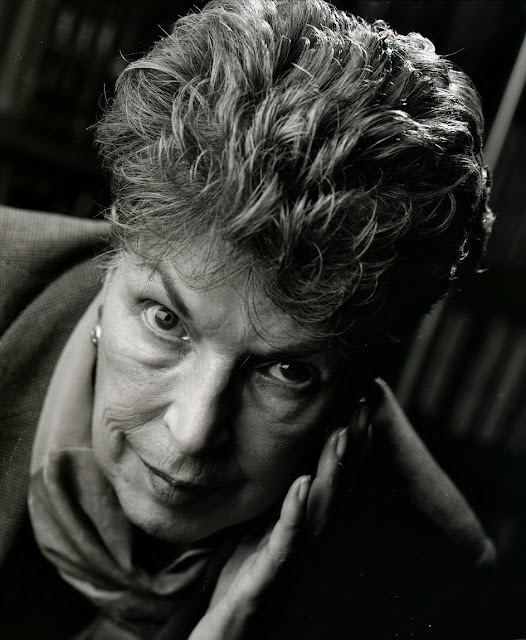 When I met Ruth Rendell some years ago in the early 90s I told her that she looked awfully scary. She warmly smiled at me and told me she was not in the least scary. I then asked her to look at my camera the way she was not and as I saw her. She obliged. Since I also photographed her friend Baroness James of Holland Park I have reflected for years on their difference of approach. Rendell had serial killers while James concentrated on family wills and how inheritance produced vicious murders. Now at my age of 72 as I watch my daughters and how our impending sale of our house or how if either Rosemary or I go to our Maker soon I wonder if James may have been right. It would seem that wills and deaths cause many more. And James may have, in retrospect, be the scarier of the two. 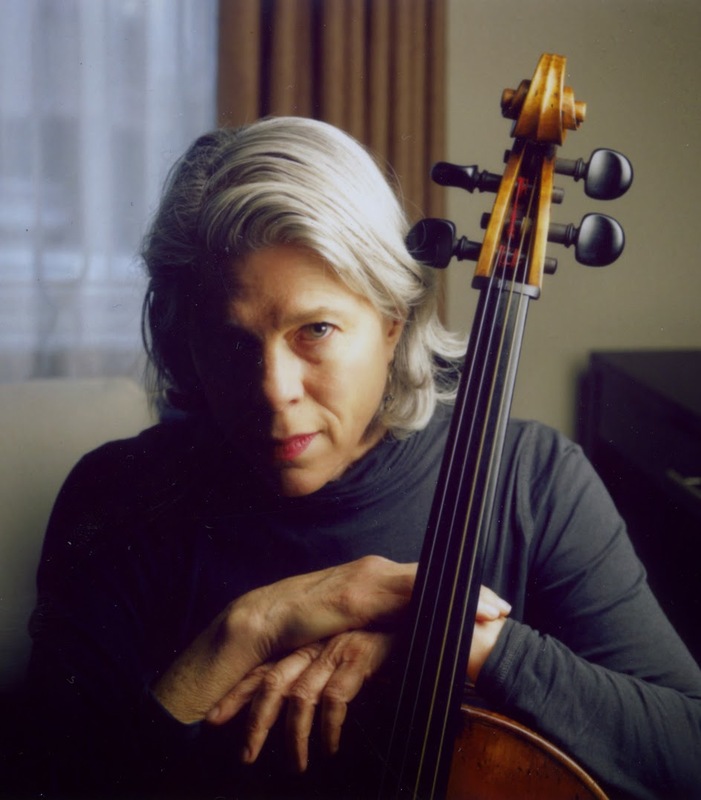 Berkeley cellist Tanya Tomkins is playing tonight at the Chan with the Portland Baroque Orchestra directed by virtuoso violinist Monica Huggett. The concert is presented by Early Music Vancouver. I had the luck to photograph Tomkins today at 12:30 in her hotel. This is the Fuji “Polaroid” I took. I imagined it last night in my-middle-of-the-night insomnia. Tomkins plays with unadulterated passion. I do believe my portrait miight show us a glimpse of it. The Orchestra is playing Antonio Vivaldi’s Four Seasons but I will be watching Tomkins from my third row (centre) seat as she bangs (she promised me she would) Vivaldi’s String Sinfonia “alla Rustica” RV 151. I did not return to Goya the next year and I never did ask Jorge Wenceslao (Wency) what his initiation into manhood was like. So it was in 1999 that with my Argentine painter friends Nora Patrich and her husband Juan Manuel Sánchez we embarked on a project to display on canvas and on photographic paper our mutual nostalgia for the country of our birth. We were amply helped by one terrific Argentine woman called Linda Lorenzo. We worked with her for a year. My Lorenzo file are thick with more that the normal allotment of very good pictures. She was that good. We had fun drinking mate after our sessions. During them we played Piazzolla or classic tango music in my studio and in Nora’s house. We were steeped into a feeling of deep nostalgia for a place we all missed. Many of our joint images involved our love for the labyrinth, mirror and knife poems and stories of Jorge Luís Borges. We also shared personal stories. 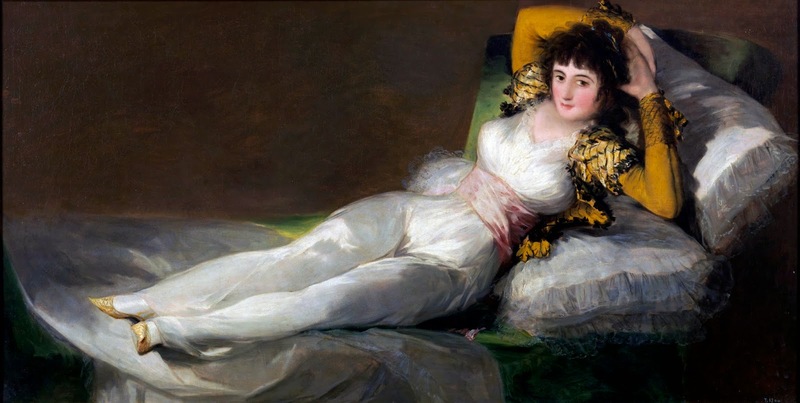 In my case one that I found very satisfying was the session that I called “Una Siesta en Goya”. The idea came to mind when Nora, Juan and I (and my wife Rosemary, too) went to see (twice) the Carlos Saura film Goya in Bordeaux. Juan and I thought we could do a double nostalgia all in one. We would put Linda on my studio psychiatric couch, hang some mosquito netting and illustrate a romantic view of my own siesta in Goya. But the photograph (one I cannot place here as it is a full frontal one) would also be a homage to Goya’s La Maja Desnuda. We purposely painted and photographed Linda clothed (also!) to parallel Goya’s La Maja Vestida. For these photographs I used the very fast Kodak 3200 ISO film which was very grainy. It was the only film I could use with my Japanese swivel-lens panoramic camera, the Widelux. The camera as it does is sweep could not incorporate a fast studio flash so the existing light (dim for this kind of camera) had to be enhanced with fast film. Now if I were to take these pictures again my Fuji X-E1 would take a much sharper and detailed panoramic. But the magic would not be there as it would be impossible to bring back Nora, Juan and Linda. My studio was torn down and a modern building has replace what was then called the Farmer Building. This blog will be slightly unusual. It is all about how three musicals, all held in the Royal City of New Westminster, made me finally decide that New West was not a place to avoid (at all costs). Those three musicals dispelled my idea that New West was a place that depressed me.Two of them were Annie last year and this year My Fair Lady. Of the third you will read below. To begin with I believe that our Lower Mainland is an urban sprawl that for reasons that escape me, does not promote the idea of mutual exploration. This is particularly the case for the arts. Few if any from Vancouver may have ever visited the innovative and modern Surrey Art Gallery. And I wonder how many of the people in Surrey have ventured forth to visit the VAG. This mutual exploration goes further in what I see a cubbyholed arts community. Those who may favour Contact Improvisational Dance (as seen at EDAM) will probably not attend Ballet BC performances. Neither audience would ever be seen or caught dead at a GOH Ballet program. In music it is the same. You like new music? Don’t bother with Early Music Vancouver or the Vancouver Symphony Orchestra. In theatre the same fragmentation occurs. Musicals are affected even further. If you go to a musical you will see that the audience look like me (72) and may be even older. Musicals cannot possibly be avant garde. And yet judging from my wife Rosemary and my sojourn (via the exceptionally complicated signage of Marine Way) to New Westminster for the opening night performance of Out of A Dream you would think otherwise. This tight production, written and directed (and sung, danced and acted) by Peter Jorgensen’s Patrick Street Production made me think and re-define my concept of the avant garde. Out of a Dream was performed in the brand new soaring and modern Anvil Centre Theatre (on Columbia a mere yards from the Skytrain Station). The space perhaps can only be compared in its modern appointments with that of the Kay Meek Centre in West Vancouver. You might wonder if somehow you never heard of a musical by Rodgers and Hammerstein called Out of a Dream. No such thing happened. Peter Jorgensen skilfully put together a musical play in which the songs by the famous pair are weaved in a disparate chronology to tell the story of a young woman who leaves home with suitcase to follow a dream. The six performers, Jenny Andersen, Peter Jorgensen, Katie Murphy, Sayer Roberts (nice pecs!) and Eva Tavares. They all sing and dance to perfection but let me digress via Dal Richards. In a previous musical in New Westminster, My Fair Lady, Richards and wife Muriel sat next to me and my granddaughter Lauren. I asked Richards a very personal question, “How many times have you been in New Westminster this year?” His answer was a predictable, “Like you, two.” But Muriel Richards interjected, “I am from New West so I have been here many more times.” With that settled I asked another question to which Richards did not let me finish. I asked, “Did you notice the…?” He loudly replied, “Yes, the legs!” Who was it that said that women are as old as they look and men are old when they stop looking? Dal Richards is a very young 98 year-old man. I am not as young as he is but I must concur on those legs. The orchestra made up by Nico Rhodes on clarinet, bass clarinet, alto sax, soprano sax and flute, Scan Bayntun, piano, Marisha Devoin, bass and Alicia Murray on percussion and vibraphone (nice touch the vibraphone) was tops. Richards was particularly impressed by the man with all the winds and reeds. So was I.
Rosemary and I were able to use the most (not quite too complicated) credit card street parking and found the city of New Westminster refreshingly with-it in modernity. We managed to get back on Marine Way (I have no GPS in our car) almost without any jerking move (no jerking move and we would have been on the Queensborough Bridge to parts unknown) and when we got home we both had smiles on our face. The reason perhaps for my black-cloud-concept for New Westminster may have been from our late 70s Burnaby days and driving to the Patullo bridge and first passing by the depressing prison. 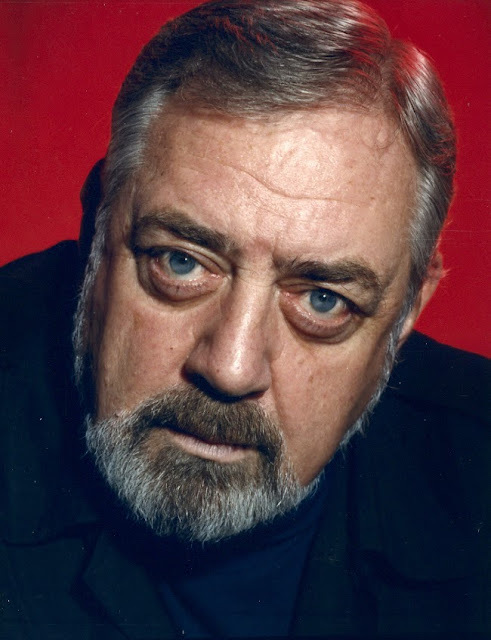 I was lucky to have photographed a New Westminster favourite son, Raymond Burr twice. Every time he told writer John Lekich and me how he loved his hometown and its restaurants. Burr was the sort of warm man who looked at you when he spoke to you and you instantly loved the man. I should have known sooner about his hometown. Luckily I have in me a few years more of New West musicals (and who knows what else?) and the purchase of a GPS might make getting to the Royal City even easier. Out of a Dream ran from April 29 to May 3 and was presented by the laudable Royal City Musical Theatre and the Massey Theatre. My friend bassist Curtis Daily promised to write an essay on the difference between the strings for baroque instruments and modern instruments. When I posted the blog Four Seasons At The Chan - Barking Dogs Included this morning, Daily had not sent me anything. I understood that he was extremely pressed for time as he was rehearsing with the Portland Baroque Orchestra the music for this Friday's concert. This early Tuesday morning his essay arrived. You will find it below! This is something that nerds do doctoral theses on, but because I don’t have time to do one I’ll try to keep the answer to a manageable length. Baroque strings for bowed and plucked instruments are a product that existed towards the end of an era of musical string production using animal intestines for its basic core material, that was continuous for at least 2,000 years. In one of the Egyptian tombs was discovered a harp, strung with gut strings, that was still playable. That discovery also answers the question about how long gut strings last, if stored in a cool dry environment - a very, very long time. Though the beginnings of gut string production are definitely lost in the foggy mists of time, we can look back a few centuries and see that the quality of the gut was good. The level of virtuosity that was required in order to play the higher level of compositions for viol and lute, especially, of the early baroque era, certainly necessitated a string of very high quality so in this brief treatise we will make that assumption. However, not everything was perfect, largely due to the lower strings speaking more slowly than the upper strings, and the human condition of trying to improve something when possible in everything, also prevailed with strings. With any instrument, when the pitch is lowered, if the tension and scale remains the same, the string must become larger in order to maintain sufficient playing tension. When the string becomes larger in diameter without increasing the density in some way, the response slows. Lower strings of all fixed speaking length suffered from this phenomenon, and it is completely due to some basic concept of physics (Newtonian?) that I do not understand. Harps don’t suffer from this so much because at some point a long time ago harp makers figured this out and created the characteristic shape of the harp, which takes into account the length/pitch issues between strings. Something that was discovered at some point in time that we will never know for sure, is that if the density of the lower strings of a fixed length instrument, such as the violin, could somehow be increased, the response of that string would be faster and more sonorous. There are a few ways to accomplish this and couple that have been tried are; impregnating the gut with a material that adds density, cinnabar for example, which would definitely contribute to the description of “crazy musician”. Or by applying a winding of wire of some sort to the surface of the string. Silver and copper would be obvious choices, given their workability. However, just watch someone pull silver wire from a piece of silver if you have an opportunity, and you will be filled with awe at the process. 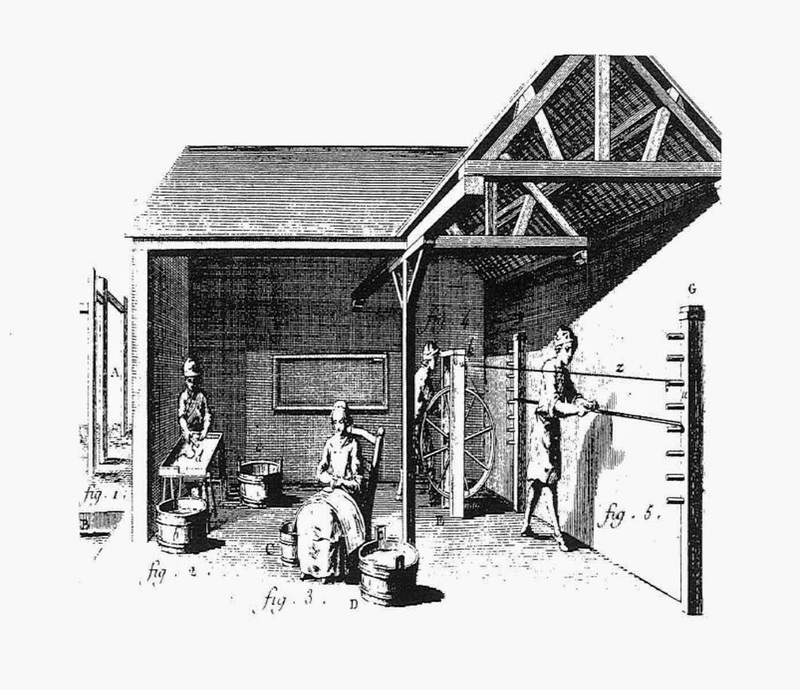 What we know for sure is that there is an advertisement in an English publication, dated 1664, that promotes gut core strings that have a wire winding on top of the gut, and that was probably the beginning of the modern technological era with regards to strings. What we see to start happening after this date is the predominance of the cello over the viola da gamba, almost certainly because of the more powerful, and fewer, wound lower strings. We also see the advancement of the guitar vs. the lute family plucked instruments for the same reason. This is largely because of those instruments’ greater ability to project when the lower strings were strung with wire wound strings, and the desire to project very well at a reasonable vibrating length of the string. At this time, too, was a transition to larger and larger performance spaces, in which instruments with better projection would have been very desirable. Instruments were also being modified during these times in order that they would have better projection by changing neck angles. One issue that has been an issue all along is that the top strings of violins are very highly tensioned and tend to test the quality of a gut string. The standard method of determining the correct gauge of a violin e’’ string historically has been to tighten it until it breaks, then back off by 1/2 step. Wire strings, which have been used on harpsichords for a long while, have also been tried on violins as early as the mid-18th century, in the search for a more reliable top string. After the acceptance of wound lower strings in the late 17th century, things probably remained relatively predictable, while developing better polishing techniques, until World War I. Gut strings, in addition to being excellent conveyors of sound, are also excellent thread material for other applications, including gut sutures. There was such an incredible demand for suture gut during WWI (let’s try not to dwell on the overwhelming sadness of this reality right now) that the gut making regions of Italy, which were the centers of gut string making in Europe, were sequestered for suture gut production and there was no gut available for music strings. Logically speaking, if something isn’t available and people absolutely need something, they will figure out something else that will work for whatever they can’t get. Hindemith, in his book “The Composer’s World”, postulates that the advent of radio and its tinny sound, contributed to an acceptance of a more wiry sound. The transition to wire top strings for violin and viola occurred during this time so it could logically be suggested that those two circumstances ushered in a new era of stringing. Further, we have now firmly arrived in the technological era and string makers are experimenting with all kinds of ultra-modern strings for violin family, using different core and winding materials. Heifetz was known to use a wire e’’ string with a gut a’ string, so we can observe from the stringing of a 20th century musical icon that gut still was an important material for musical strings between the two world wars. However, for the upper instruments gut has been superseded to some degree as a core material by much denser, and/or more reliable, materials that allow for a smaller diameter string that speaks just as quickly. Just as important, the design of the bow was also changing, also contributing to a stronger and brighter sound. I came to this party very late, but by virtue of being a bassist, which is a group of musicians who are known to be late for everything except for arriving at the gig, I discovered from interviewing the older bassists I worked with that all had started out playing on gut, which was still common among bassists into the 1960’s. Listen to recordings of Jimmy Blanton, Paul Chambers, Oscar Pettiford, Israel Crosby, and hear double bass gut stringing at its finest. They all knew exactly which gauges of string their basses wanted for any occasion. In closing, technology has driven most things since the mid-18th century, and stringing of bowed and plucked instruments is no different from anything else, so updates have always been periodically necessary, but not quite at the pace of current times with Apple/MSFT. At the beginning of my historically informed music career in the late 1980’s I used Aquila Corde’s ‘loaded’ gut lower strings on my bass, instead of wound strings. These strings were based on early densified strings but instead of using cinnabar for the densifying material, copper solvents were used. Even though there is little historical evidence for these, when one got a really good string of this formula, it was nirvana. Sadly the ratio of good strings to bad was pretty low so Aquila discontinued them in about 1996. On the plus side, I didn’t become a mad hatter. Now I am using a more modern stringing for my lower strings that is densified by winding a layer or two of silver wire on top of a core string of gut. This setup works well but because silver reacts to temperature much faster than gut, the lower strings of the double bass go out of tune quicker than the plain gut upper two strings. In the end all this does is to point out that for everything gained through technology, something is also probably lost. High tension modern stringing produces a brighter and louder sound, but subtlety is diminished. The tonal result for violins can be something like a Texas Chainsaw Massacre. If one reads the recent article in the “New Yorker” about the viola da gamba, and its relative value in today’s musical lexicon, it will only help to solidify, or dissolve, whatever opinion one might have. And if lastly, while listening to a very modern recording, one feels that gut stringing is somehow an anachronism, it is advised to also listen to the strings in a different modern recording, where the opinion will almost certainly be changed. Gut stringing is still alive and while not really well, is not dead. Below you will find a meandering essay on Antonio Vivaldi and his Four Seasons. You can skip most of it as all I want to stress is the unique experience of listening to Monica Huggett and her Portland Baroque Orchestra play them this Friday evening at the Chan. But there is lots of stuff ancillary to attending the concert that might help the adventurous reader to further enjoy the concert by looking forward to some of my “facts” seen and heard as reality. I find it impossible to listen to any Vivaldi without equating (placing) his music in the city where he composed. Venice has been painted and described many thousands of times, and of all the cities of the world is the easiest to visit without going there. Sometime in 1998 my companion and I entered the restaurant Villa del Lupo (now called Lupo) on Hamilton Street. As per usual in those Vancouver days of fine dining restaurants piped in Vivaldi’s Four Seasons. Other more hip eateries usually featured either the Gypsy Kings or Billie Holiday. I requested we be given a table far away from the Vivaldi Muzak. We were taken downstairs and ushered into a small dark wine cellar. The heavy door was slammed shut and we were suddenly in complete silence. I stared at my companion and I secretly observed he was a dead-ringer for the Red-Haired Priest. He ordered a Sancerre to accompany our ostrich (I don’t remember it if was stewed or roasted). The host had explained that a few months before when Robert De Niro had been making a film in Vancouver he had developed a liking for the restaurant’s Italian food but had wanted privacy. He had told the staff that a specially shaped table could be made to fit the wine cellar. And so, it was done. Just a few months later I photographed the Canadian band Great Big Sea in the same place. Destrubé is an unconventional violinist, ready to play Bartók or Bach, Britten or Buxtehude, Brahms or Bieber, take your pick. In fact part of that PBO program involved two contemporary works based on the idea of the Four Seasons and placed between Spring and Summer, Fall and Winter. The former was ‘Bloom', by Linda Caitlin Smith and the latter ‘Not a Single Stone’, by Peter Hannan (a compostion based on five haiku, one of which includes reference to a barking dog), Hannan's was a humorous connection with Vivaldi’s second movement of Spring in which the viola mimics a Venetian barking dog. Daily told me that he, the two cellists, the harpsichordist and the theorbo player (a very large, ungainly and long member of the lute family) will be sitting down. The PBO’s Four Seasons was a revelation for me. My previous experience had been in the early 70s in Mexico City’s Bellas Artes where I had heard both I Musici and I Solisti di Zagreb play Vivaldi four concertos from his 12 concerto Opus 8 Il cimento dell'armonia e dell'inventione. Like Bach’s Double Violin Concerto I soon relegated the Four Seasons to my record collection’s basement with all the other worst hits. But even the most jaded will fine refuge (every time I hear it) in the second movement, the Largo of Winter. I love to listen to it in all of its variations as played by so many performers through the years, fast, slow, with little ornamentation or not. In fact any performance of the Four Seasons is worth attending just to find out how the soloist will play that Largo. Hugget told me three weeks that her ornamentation for the Largo will be restrained. Venice’s Ospedale della Pietà, which was behind today’s Pietà Church, was not a hospital, but a hostel for orphaned girls. (In other cities, these church-run institutions, sponsored by the government, were also called conservatori which meant poorhouse or orphanage, and which gave us the term ‘music conservatory’.) It was there that Vivaldi tried out his new compositions on his captive choir. Since one of his several hundred works is today, if not a jukebox hit, at least a standard Muzak favourite – The Four Seasons – it seems appropriate that probably the first audience to hear it in rehearsal was that of the young orphan girls. The girls are educated and maintained at the expense of the State and their sole training is to excel in music. Thus they sing like angels, and play the violin, flute, organ, oboe, violoncello, and bassoon – in fact, there is no instrument so big as to intimidate them. They are cloistered like nuns. They perform without outside help, and at each concert forty girls take part. I swear there is nothing prettier in the world than to see a young and charming nun, dressed in white, with a spray of pomegranate flowers over her ear, conduct the orchestra and give the beat with all the exactness imaginable. Some thirty-five years later, the English musician Charles Burney, having seen such a successful organization, tried to do the same with the Foundling Hospital in London. It was not a feasible idea. Whether this was due to the natural English lack of a musical ear or to the absence of pomegranate flowers in England we do not know. My first experience with baroque music played with period instruments happened in 1963 when a friend in Mexico City told me to listen to Handel’s Water Music played the “old-fashioned” way. To me it sounded off-key and slow as if it were tape wow on his reel to reel. Christina Hutten, a local keyboardist who specialized on organs and harpsichords explained it this way when I asked her if the idea that when music was played in churches the pitch of orchestras was regulated by the pitch of that local church organ since it was difficult to change the pitch of such instruments. The short answer to your question is yes you can change the pitch or temperament of an organ, but only by cutting or adding onto pipes (obviously an expensive and laborious process). The relationship between organ pitch and pitch used in salons and concert halls, however, is by no means straightforward. For those who may be slightly confused there is a rule that is far away from being a rule that the pitch of a modern symphony orchestra and that of a baroque orchestra differ. For about the last century, the standard pitch level has been A-440, meaning that, wherever you go in the world, Western classical music is likely to be played at a pitch level in which the note A in the middle of the treble staff is tuned to 440 hz. For baroque orchestras the pitch is higher at 415 hz but not always I have been told by Hutten. pitch in France depended on whether you were playing chamber music, opera or something else. The above would suggest that my listening of that Handel Water Music in 1963 involved a low pitch orchestra. For me all that is really mumbo jumbo. I know that particularly in the 17th century many string instruments were de or un tuned in a process called scordatura so that the musicians could play stuff beyond the normal compostions of the time. Many of these scordatura notes sound like listening to Thelonius Monk for the first time. They are odd. They seem to be the wrong notes. After some extended listening the wrong notes become refreshing right notes. Vivaldi wrote many compositions with scordatura. Antonio Vivaldi has been praised as the man who wrote six hundred concertos, and as often disparaged as the man who wrote one concerto six hundred times [attributed to Stravinsky]. Both estimates are wrong. In the first place, Vivaldi’s true responsibility extends, at last count, to 455 concertos, not six hundred, although additional manuscripts recently uncovered in Germany and Scandinavia may add to that total. He also wrote a good many sonatas and sinfonias, ninety four (by his own count) operas and a quantity of liturgical music. And in the second place Vivaldi was no formula-ridden hack, but an ingenious and inventive composer whose music, highly valued by his contemporaries, including Bach, exemplifies much of the best of the high Baroque Style. As I am writing this, today Monday, I have in my immediate memory my visit to the Arts Umbrella Dance Company studios on Granville Island yesterday. 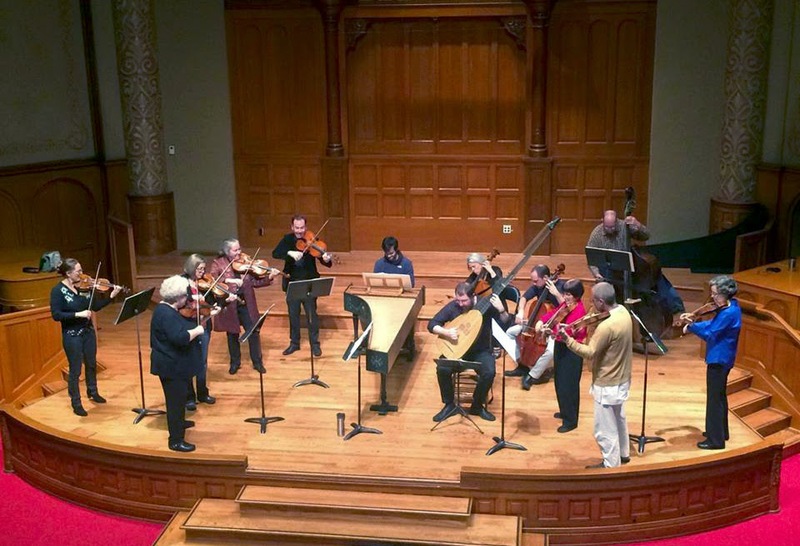 I watched Sabra Perry rehearse a work by John Alleyne, The Four Seasons with Vivaldi’s music. I asked her what version she was playing on the CD player. She admitted she did not know and to me it could have been any cookie cutter version still played in the fine dining establishments of our city. Besides that first virsion I heard played by the Pacific Baroque Orchestra I remember these. The Italian group, Il Giardino Armonico, plays Vivaldi and other Baroque music with a loud banging (my opinion) that would make your fine Sancerre turn into vinegar quickly. But they have thrown a wrench into the idea that Baroque music can only be played one way. I particularly love their Merula chiaconna. In our often fractured or cubbyholed arts community those who are fans of the Vancouuver Symphony Orchestra might think twice about spending an evening with the Turning Point Ensemble. Those who might love Early Music Vancouver presentation's like this Friday's Four Seasons might not be caught dead at the Orpheum listening to a modern symphony's version of the Four Seasons. I might not either of the latter but I will go to the VSO's playing of any Shostakovich symphony or a concert dedicated to composers of film music. Part of the problem may be the starched shirt look of a modern symphony. "They are up there sitting, we are down here sitting." sort of thing. Then you add the concermaster walking in, bowing and then helping tune the orchestra. When a soloist finishes he will bow and shake hands with the musical director and then with the concertmaster. There seems to be too much pomp and circumstance. 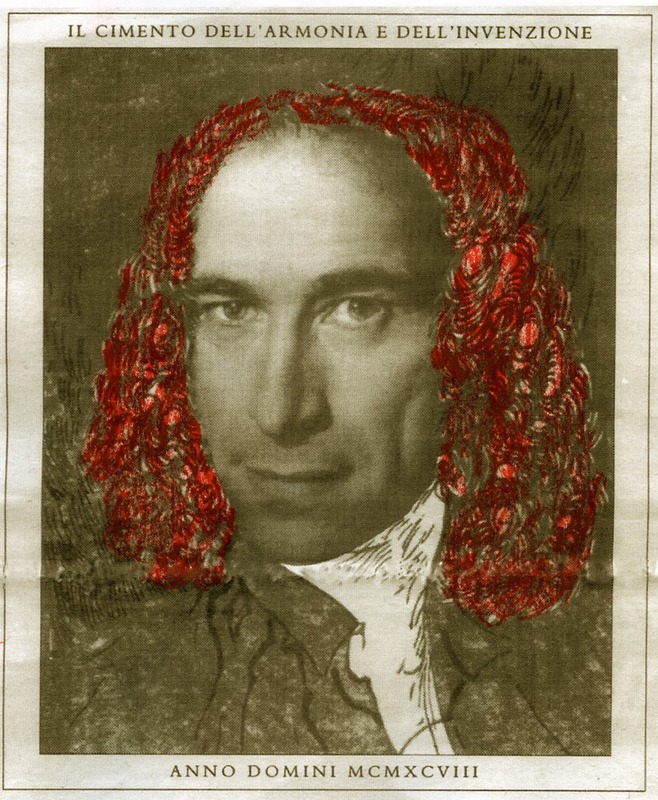 But then we must understand that before heads were severed from bodies during the French Revolution, composers were paid by the nobility and performed for nobility. We even know that the nobility could treat musicians like indentured servants and Haydn had to compose his Symphony number 45 (Farewell) where musicians would, one by one, walk out of the stage, so as to convey to their reigning lord that they needed a vacation at home. The French Revolution pretty well helped end musical subsidies for composers and musicians. Church music with all those Reformations had also dwindled. The new audience was to be found in larger halls, and opera houses where instruments had to be louder (no longer a king's chamber) needed to be modified so they could be loud. This brings us to the explanation that I must make here (and remember I am not a musician or music critic). Those wonderful Amatis, Guarnieris and Stradivari of the 17th and 18th century had to be beefed up in the 19th century to allow for the added tension of strings that were made tighter for volume. In order to get more of a handle (leverage) on that violin or viola Louis Spohr a composer contemporary to Beethoved invented the chin rest. Curiously only a few days ago Chloe Meyers told me that the clamping of the chin rest to the violin was a detriment to the sound of the instrument. Curtis Daily, the bassist of the Portland Baroque Orchestra was supposed to weigh in here with information on the makeup of string instrument strings as he has a side business and sells them. So I will have to simplify and tell you that period instruments of the string variety used gut strings while modern instruments used a combination with metal. But wait! Curtis Daily did deliver here. And here is the final crux to all the above. Those 17th century string instruments are now (the very good ones) new or modern instruments in that they have been modified to the standards of the 19th and 20th century. Few old instruments survived without modification. What this means is that these musicians who play period sring instruments have two choices. The ones with money buy good old ones that have been modernized and modify them backwards. The ones with less money buy brand new or near brand new instruments that have been built to the standards of the Baroque. 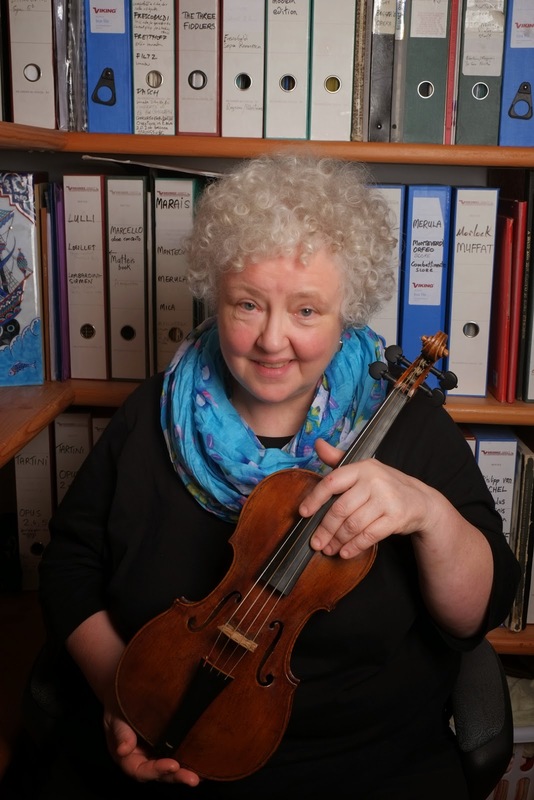 What kind of violin will Monica Huggett play on Friday? It's a Landolfi and it was in modern setup when she got it. I know she had a new neck, bridge and tailpiece installed, I'm not sure what else. The modern violins and their Baroque counterparts are really very different although to the amateur eye the might look the same. The bows are very different, too. I asked Destrubé what he would if he showed up at one of his Microcosmos String Quartet concerts to play some Bartók and found he had packed his French Baroque violin. His answer was startling to me, "I would drive back home to get the other one." To this while lecturing at the Cecil Green Coach House at UBC, Destrubé revealed to us that the bows of string instruments are made from male horses (stallion strings they are called). Why? It seems that mares when they urinate they do it backwards (not forwards) and the urine affects the quality of the horse hair. It is much easier for a small group to hear the A from the cello. We always tune the bass section firsts, string by string, and then the cello passed the A to the violins. It's a good system. ...as the Venetian, savoring a slice of boar's head marinated in vinigar with marjoram and paprikm took stespe a few closer to a grave hard by which he had already been studying for a time, because it bore the unusual sonorousness for those climes. "I-GOR STRA-VIN-SKY, " he said, separating the syllables. "That's he, all right, " said the Saxon [Handel] following suit. "He wanted to lie in this cemetery. "Good musician, " said Antonio, " but at times, very traditional in his approach. He draws on the same antiquated subjects: Apollo, Orpheus, Persephone...when will it end?" "I know his Oediupus Rex, " said the Saxon. "Some say that towards the end of the first act - Gloria, gloria, gloria, Oedipus uxor! - it sounds like my music." "But...where did he get the outlandish idea of writing a profane cantata on Latin text?" said Antonio. "They also played his Canticum sacrum at Saint Mark's, " said George Frideric. "It's full of medieval-type embelishments that we stopped using long ago." "The thing is that these so-called 'modern' maestros are very concerned with what musicians of the past did - and sometimes they even try to rejuvenate their styles. We are more advances as far as that goes. I don't give a damn what the operas or concerts of hundred years ago were like. I write the way I have to write and that's it."